This is my first post at CarJunky. Accept my apology if I miss the rules to post accurately. The main problem is "The engine randomly shuts down while at idle or stop-at-a-signal condition. My car is Toyota Camry 1997 (LE). It was operational smooth until I discovered water was coming out of the exhaust. The mechanic fixed the engine head gasket leakage problem. But, now I am facing a different problem. I am describing the premise and symptom of the problem here step by step. 1. When the engine is cold (say in the morning), the engine does not want to start while cranking. Even though it starts, the RPM is really low around 500 rpm. Before the water leaking problem, the rpm at start was normal (~1500-200 rpm). 2. To start the car I have to hit the gas paddle repeatedly for some time to initiate the start. Otherwise, it just want to crank with battery (not starting). 3. Even the engine comes to operating warm-up condition after running some times, if I stop at a signal or just idling- the engine "RANDOMLY" shuts down. What I mean is that, at ~50% time while stopping at a signal, the engine runs around ~500 rpm. And, others times, it just stops.
? Can it run nicely once running? IDK - It will need a code reading and should have a check engine light on now with that. Just because so much gets unplugged and plugged back in in the job of a head gasket do a look for anything that isn't connected properly. Low idle could be it doesn't know it's cold by an unplugged sensor - code would pick that up. How long has it been since this work? If recently take it back and ask why this now after the work? Most of time when you have a problem like that it is the rotary valve inside the idle control housing sticking with carbon. 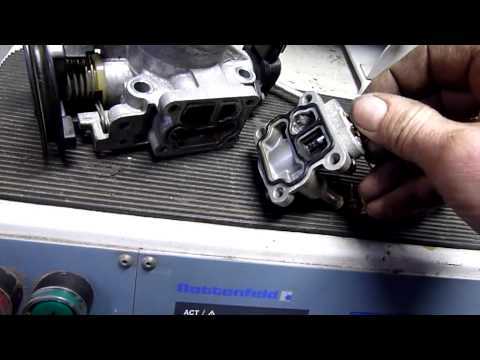 You'll have to remove the throttle body and remove the idle air control housing from the throttle body. Remove the electronic coil from the housing, so you can spin the rotary valve stem. Clean the valve and the inside of the housing really good with carb cleaner and a tooth brush, so the valve moves freely. Then put it all back together and it should be alright. Replace the rubber gasket and you'll need an impact driver with a Phillip bit to break the screws loose. Thanks Tom. Yes, it runs nicely once the wheel keep rolling. In fact, the A/C also works perfect at that time. Had a rough time with the car, stops in the middle of the road. Now, it's not taking start (90% time) while cranking. But, if it takes, as soon as I stops in a red light or right turn, the engine shuts down. If I can take the car to AutoZone or Adv Auto Parts- I will retrieve the code meaning & update you. Thanks again. Thank you for the suggestion. I will try to do that and update if I get lucky. Thanks again. Thanks a lot. This is informative. And using your suggestion as a reference, I did some online studies- and found that there is a IAC clearer spray that might give a quick remedy (fingers crossed!). Thanks again. I don't have the tools right now to open-up the IAC Valve. But, following this tutorial, seems it might be doable. Your feedback will be extremely helpful. Careful with Walmart and "fast food" auto places. Key questions is if this is new since head gasket job go back! Stick to school and let the techs who just worked on it probably find something was harmed or unplugged in that job which is involved. So easy for now a 20 year old car to break a vacuum hose, plug to something that messed up the show. I deleted your links because they are not allowed. Yes, that spray can be used but it's not magic. It's what you do with it that makes the difference. You need to use a scrub brush as I instructed. The video was just a video about doing what I advised you to do but it wasn't a very good one. It requires a whole lot more brushing that he did. Follow my instructions and you'll do a whole lot better. Sorry, I was not aware of this (link issue). In future, I will not post any link. OK, then I will follow your instructions and will update then. Thanks again & appreciate all of your suggestions.